Bio Draw 3.0 provides solutions to engineering problems while simultaneously addressing environmental and aesthetic concerns. This interactive CD is indispensable for any professional who designs or specifies biotechnical erosion control projects! Try our "Test Drive of Bio Draw 3.0" to view a sample of the CD! Bio Draw 3.0 is an interactive CD which describes design and installation procedures for 38 biotechnical soil stabilization techniques, along with 39 typical drawings of soil bioengineering techniques in .dwg (AutoCAD) and .dgn (MicroStation) format. All erosion control techniques presented incorporate live vegetation. Bio Draw is intended to help solve engineering problems while meeting the ever-increasing environmental demands prescribed by sensitive ecosystems. NPDES Phase II compliant! Bio Draw describes in detail a series of "soft" bioengineering techniques and practices such as LIVE FASCINES, LIVE POLE DRAINS, COIR ROLLS WITH BRUSHLAYERING, POLE PLANTING, MODIFIED BRUSH LAYERS, BRUSH MATTRESSES, and MORE! The Bio Draw CD is liberally illustrated with "before" and "after" photos of real case studies which describe various installation steps for each technique. Clicking on the photos will expand them so details can be readily observed. Both Erosion Draw and Bio Draw are developed by Salix Applied Earthcare, a Natural Resource Consulting Firm which specializes in Erosion Control, Bioengineering, Environmentally Sensitive Slope and and Streambank Stabilization, Watershed Restoration, Road Removal, and Natural Channel Design. Salix also offers Nationwide Training and Consulting. BioDraw 3.0 can be purchased for a cost of $199, plus S&H, (add sales tax in California). We ship overseas too. All of these practices have been implemented and monitored for their effectiveness by bioengineering practicioners! 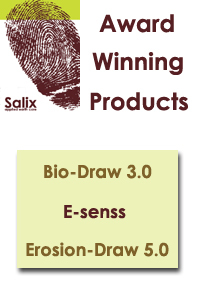 Bio Draw 3.0 is the most credible and comprehensive bioengineering compendium in the erosion control industry today! Not only do you get CAD drawings and construction specifications, but you also get comprehensive information for all aspects of biotechnical projects, such as the principles, rationale, and planning for a bioengineered approach. 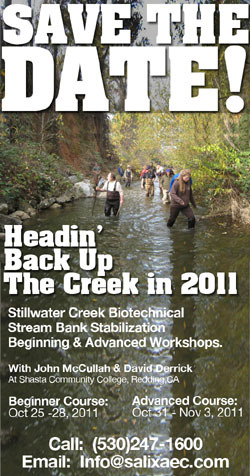 The BMPs are conveniently separated into "Soil Bioengineering and Biotechnical Stabilization Practices (Ground Bioengineering)" and "Biotechnical Streambank Stabilization (Water Bioengineering)". Many informative photos accompany each BMP, showing installation procedures along with "before" and "after" shots of case studies. Each colorful photo can be portrayed in a larger view with the click of your mouse. 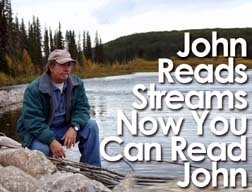 The CD is user-friendly, and it's as easy as navigating through this website. Technical support is also readily available if needed. 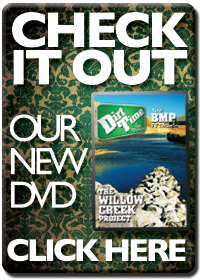 The Bio Draw CD also includes a directory of erosion control product manufacturer websites downloaded onto the CD. This way, you don't have to be "on-line" in order to view and analyze products you may need for your projects --- from coir logs to geotextiles.